Treasury and Finance Minister Berat Albayrak announced the New Economy Program at the Presidency Dolmabahçe Labor Office, which will cover the years 2019-2021. 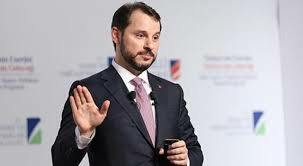 According to Albayrak, “the current account deficit will drop to 2.6 percent. employment is another of our key areas. The unemployment rate will be reduced to 10.8 percent by 2020. 2021 In Turkey, will be creating 2 million new jobs”, he said. >> For the first time in our history we are bringing together all major stakeholders in Turkey’s economy, we have prepared a comprehensive Medium-Term Plan. From 2002 to 2013, we have made significant steps in many areas. Inflation went down to one digit. Approximately 7 million new jobs were created. >> This program, which we explained to you today, is based on three main bases. Firstly, this process, which we establish as equilibrium, then as a discipline and ultimately as a change, presents a road map of economic equilibrium in the period of 2019-2021, before moving to a more sustainable model in some key areas of our economy. Our main objective is to put the economy in an acceleration that will provide added value in every policy change we will make. We will bring growth to a sustainable and healthy line. Our main objective is to achieve a growth rate of 3.5% in 2020 and 5% in 2020. >> We highlighted the banking areas of inflation, public finance, employment and current account deficit. The Central Bank will continue to use all of its objectives independently for price stability. But this is not enough for inflation. We need community-wide support. The restructured financial stability and development committee will be implemented. All of our ministries will follow this process closely with the action plans. >> Another important area is employment. Unemployment rates will drop to 10.8 percent in 2020. In 2021, Turkey will have created 2 million new jobs. Another important step forward, value added point. Here are some of the sectoral projects that will increase the value of the country’s economy. >> Thereafter, in the center of the investment decision, Turkey will be in order to increase the added value of industry-focused programs. Pharmaceuticals, petro-chemistry, energy… The sectors that will have a direct impact on the current account deficit will be prioritized and projects will be put into practice. We will be the followers of unseen actions. We will follow up the ministries’ actions. >> From the start of the implementation of the New Economic Program, we will monitor the implementation of the actions on a quarterly basis and take the necessary correction measures if necesary. After taking all these steps, we will realize our projects for a prosperous life with the support of all our stakeholders. Treasury and Finance Minister Berat Albayrak announced the New Economy Program which will cover the years 2019-2021.